Most double kayaks, from a 17 foot touring double to a 23 foot double sea kayak like this one, will go further and faster than a single. Tandem sea kayaks are usually 20 to 23 feet long and weigh 66 to 100 lbs dry and empty. They are awesome performers over long distances. Outward Bound's sea school at Aberdovey found that if you put a pair of inexperienced teenagers into an 18 foot Kirton Tasman two-seater, they could easily oustrip an instructor in a solo sea kayak. With a strong kayaker in the rear cockpit, the occupant of the front cockpit may not need to do very much. This is great for a parent kayaking with a small child, or for any kayaking group if somebody gets tired or injured. Everything has its disadvantages. A double sea kayak may be 6 feet longer than your vehicle or garage. Unless it is made to fold or to take apart into sections, it may not be easy to find a place to store it or safe to carry it on your car. To roll a tandem kayak after a capsize takes real confidence in your partner, and good timing. Your editor has seen quite a few double kayaks capsize but has never seen one roll up again on the sea. Topolino Duo double kayaks on white water rivers, yes, and we're sure that expedition kayakers also roll their double sea kayaks every time, but we have never seen the crew of a touring double achieve it at sea. And when the crew make a wet exit, very often they are scared and shaking (they didn't expect this to happen). Very often the kayak has a lot of loose equipment inside. Unless it was designed for use on the sea it probably does not have enough flotation to empty using ordinary techniques. A double kayak may have a volume of well over 500 liters which means it can fill with half a ton of sea water. Sea socks are a great way to limit this but they have a way of coming detached from the cockpit coaming in an emergency. Any sea kayak should be fitted with front and rear bulkheads and preferably also some foam buoyancy and/or air bags in the ends. A double kayak also needs plenty of flotation in the space between and to each side of the rear kayaker's legs. Even then, emptying it out is likely to be a challenge if it capsizes or floods at sea. Consider carrying a bailing scoop to get water out of the cockpit area faster than a pump can manage. See Emptying A Heavy Kayak. There are some very fast sit-on-tops, but in this section we're looking at the ordinary kind that currently outsells classic sea kayaks by a hundred to one. They're reassuring, tough, almost unsinkable, cheap and easy to buy new or secondhand. An ordinary SOT kayak is slow, hard work and doesn't keep you warm or dry, but the great thing is if you capsize, you don't need to be able to roll. You can just scramble back on. Ordinary sit-on-tops are great all year round in the tropics. In a cool climate they have a shorter season. The two girls above are on a trip in mid-August. It's a shallow little estuary and very sheltered but the sky is overcast, the air temperature is about 68°F (20°C) and the water temperature is about 58°F (15°C). They're wearing wetsuits, wetsuit boots, thermal tops and waterproof jackets and they are trying to avoid wavelets and splashing because if they get their legs wet, they will be chilled by the wind. And they don't want to sit in a puddle of cold water. In a cool climate, a wetsuit is enough in July-August but if you want to extend your season to May and October you will probably want to wear a drysuit over base-layer garments and thermal fleece. A lot of people go sea kayaking all year round on cool northern waters, but not often with a sit-on-top. This sit-on-top kayak is quite long (14 ft 9 inches), not all that much wider (26 inches) than a sit-in kayak, and it has a good underwater shape. Most ordinary sit-on-tops are short, wide and have a nearly flat bottom with drain holes and deep ridges or corrugations which look Space Age but are there to stop the hull flexing. They're stable enough to use a fishing rod but the cost is that they may not have the speed you want to get home against an adverse current, and they may have three times the drag of a classic sea kayak, way too much for surfing. Also, in rough water a wide flat-bottomed boat will lurch from side to side every time a wave goes underneath. An ordinary double sit-on-top powers along quite nicely if paddled by two experienced kayakers. Short, fat sit-on-tops like the yellow one below are best kept for fishing and snorkeling near the beach. 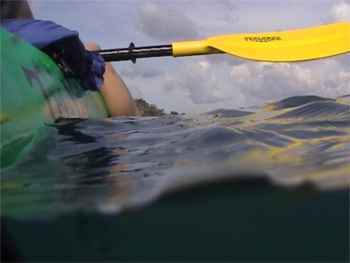 A fit, experienced, well-equipped paddler in a classic sea kayak can have a nice time on water down to freezing and trips up to 25 miles long, which would be way beyond the reach of an ordinary sit-on-top. Sticking with comfortable use by the average paddler, the limits of a sea kayak and an ordinary sit-on-top are as follows. Most reviews are, one way or another, sponsored by the manufacturer or retailer so it's interesting to see an independent comparison of seventeen kayaks by Australian adventure racing website Rapid Ascent. The kayaks included four fast surf skis, seven racing boats, three sea kayaks and three recreational sit-on-tops. The reviewing paddlers weren't too unkind about the 17 foot Sprinter sit-on-top although they did note that the paddler gets very wet even on flat water. About the 11 foot 6 inch Scrambler they said "seat hard and uncomfortable, slip around a lot, swings from side to side with every stroke, very unpleasant experience to paddle. What do I like about this boat? Nothing. Would provide zero incentive to keep kayaking. Due to extreme width of boat, you can't use a normal kayak stroke..." They just don't have the magic. One of the nice things about sit-on-tops is that you can rent them by the hour or day at many vacation destinations. This double is on an island camping trip in the tropics. Six miles at a time was plenty, but we had a great trip. Rounding desert islands, going into caves drinking from newly-fallen coconuts and encountering black storms, a water-spout, giant land crabs, monitor lizards and sea urchins, enormous fruit bats, toucans, cliff-nesting swallows, lion fish, sea snakes and once a swordfish. A long, low and usually ultra-light boat constructed in the same way as a composite sailboard. Racing skis are popular in Australia and Hawaii, rather less in cool climates because they don't protect the paddler from cold water or spray. 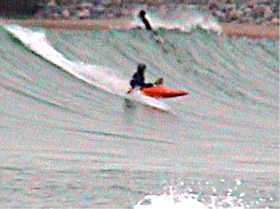 Some skis have a flared or ski-shaped front end to prevent pearl dives when the ski is surfing down the face of a wave. Pearling, when the front goes deep underwater, slams on the brakes and often causes a forward loop. Another way to solve the pearling problem is by giving the front end of the hull a fuller shape. Surf equipment manufacturer Pete Gaisford works and plays on the Atlantic coast of Cornwall, England. He tells us that the design of racing ski bows has moved on since the older model by South African company Stealth that we show above. "The deflectors have been reduced significantly with more volume added to the bow from hull to the deck, becoming more like a rough water K1". A racing ski is very attractive but it isn't for everybody. If you make a habit of bumping into rocks you may find it is not tough enough. It is likely to be unstable, with a narrow hull and a seat above the waterline. The hull shape of a very long ski, and some are 21 feet long, gives it potentially a high cruising speed but an unusually large wetted surface area, which means a lot of drag so you can only realise those speeds if you're a gorilla. There are similar sea kayaks with a full deck and cockpit. See Ocean Race Kayaks. Take a plastic playboat into the surf for even a few hours and you will get to be a much better sea kayaker. For the technique and a specialist book, see Kayaks & Surf. It is possible to surf a sea kayak. They go extremely well on fast, shallow waves out on the ocean but they're hard to control on a steep breaking wave. See Surfing A Sea Kayak. 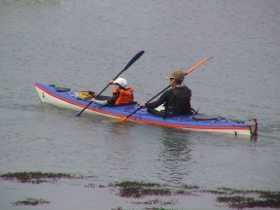 Sea kayaks have displacement hulls designed to slip through the water. They can go fast but never really break free and skim over the surface. For that, you need a planing hull, which means a true surf kayak. Short plastic river playboats surf well on river waves and they're fun in surf. Some have a similar shape to specialist surf kayaks, but in cross-section the bottom is more rounded and lacks the rail that gives a waveski or surf shoe its control. Most of today's playboats are very short indeed, and most have been scratched up by river rocks so they're very slow compared to specialist surf kayaks made of fiber-reinforced plastic. A slow boat will catch a wave only if you are in exactly the right place at the right time, when your section of the wave is very steep and just about to break. Because of their hull shape, playboats seldom break free from the water and plane properly. Because their wake does not break away cleanly from their rounded sterns, they adopt a bows-up attitude as in this photo. The result is that on a big wave, a playboat is too slow to out-run the wave and cannot reliably travel diagonally along it to get away from the shoulder (the tall wall of breaking water that is approaching you from right or left while you go blasting down the face of the wave). If you're just about to go kayak surfing for the first time, there's a lot to be said for a longer kayak with pointed ends and an oval cross-section. It will be easy to paddle out through the break, and fast enough to catch waves well before they break. For example, the Dagger RPM at 9 feet long. Or a Dancer at 11 ft 5 in long, which has a displacement hull similar to the RPM but is faster because it is longer. It catches waves very easily and is a great boat for learning to surf. True, it can do only old-school maneuvers such as the loop, pirouette and pop-out. And because it has quite high volume, if it gets turned sideways to a breaking wave you will probably be carried most of the way to the beach as when surfing a sea kayak. Even so it is really good fun in surf of all sizes. And when there's no surf, you can use it to go exploring for miles up the coast. There are several styles of surf kayak. They are generally longer and wider than wave skis. They are usually 6 ft 11 in to 9 ft 10 in long but a few reach 11 ft 6 in. The yellow boat is a surf shoe, with a flat underside like a wave ski but a deck and cockpit so you sit inside it and wear a sprayskirt. Most modern surf kayaks are nearly flat underneath so they're painfully slow on flat water but something else when they start to surf down the face of a wave. Skim stones across a pond and you'll notice that a flat bit of slate goes much faster and further than any rounded pebble. A flat bottom (a planing hull) gives a surfboard or kayak a huge speed advantage on a wave and can make it fully controllable when surfing. Where the flat bottom meets the near-vertical sides there is a sharp angle. Along the sides of the kayak, this angle forms the "rail" which enables you to carve turns. Across the back, the sharp angle lets the surf kayak's wake break away cleanly. In addition to the control given by the rail, a short, flat-bottomed surf shoe is likely to have sockets (fin boxes) under the hull, usually under the back of the seat, so the user can insert up to three vertical fins (skegs). 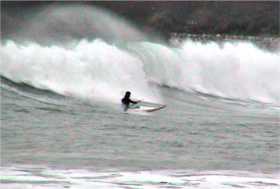 Off the wave, flat-bottomed surf kayaks have the hydrodynamics of a tea tray and become uncontrollable in high winds. They can be difficult to paddle out through steep surf. Short surf kayaks are often pushed backwards a long way and will then reverse loop when the back end digs into the water. When you get to the open sea outside the breaking waves you need to get close to the break because a short, flat-bottomed boat is too slow to catch a shallow wave. A surf kayak on a steep wave is a revelation, sliding over the surface with incredible speed and maneuverability. An expert can do remarkable things with one, such as running diagonally down the wave, reaching the bottom of the wave, turning and slicing back up to the crest, and using the wave as a ramp so the boat gets airborne for a moment at the top. Specialized surf kayaks are usually made of fiber-reinforced plastic (some combination of glassfiber, carbon and kevlar) because the slight drag of a used and furry polyethylene hull is a real disadvantage in surf. The surf ski or waveski is like a thick surfboard with a seat molded into the top and straps to stop the user falling off. It is short, often less than 8 feet long. Seen from the top it may have nearly square ends or, in the case of a really short one, the teardrop shape of a guitar plectrum. All have a nearly flat bottom, and between one and three sharp vertical fins underneath at the rear. They tend to be unstable, so a ski paddler will often dangle his or her legs in the water to help balance while waiting for a wave. Waveski paddlers tend to think of themselves as surfers, not kayakers. 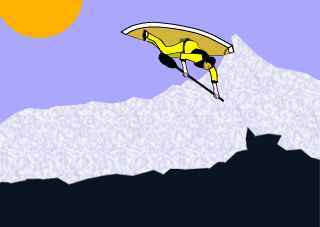 The Waveski Wisdom website by John Cullen of Queensland, Australia has lots of useful information about choosing and using a ski.